Do you think online dating is just for everyday people who aren?t being set up by their friends? If so, think again. More celebrities are joining online dating sites to seek love in a web 2.0 world. 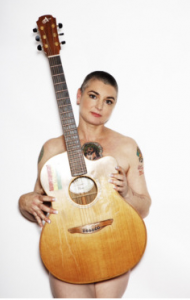 Grammy award-winning singer-songwriter, Sinead O?Connor is hoping she?ll find her dream guy on Plenty of Fish. According to CBS News, O?Connor recently shared the news with friends and readers on her blog. ? ?This is to let you all know before anyone else does that I have now officially joined the dating site known as PlentyOfFish.com (or pof) under the username of VeryCareful1 and invite anyone interested to view my profile.? O?Connor knows that you need to cast a wide net on the Internet and added, ?Although I am living in Dublin I am of course also very much indeed interested in meeting nice gentlemen from other countries.? Sinead O?Connor divorced her husband of 18-days, Barry Herridge in 2011. Other celebrities who have dabbled in online dating include Gossip Girl?s Chase Crawford on JDate, Joan Rivers who was spotted on Match.com, Pirates of the Caribbean Star Orlando Bloom, and True Blood?s Deobrah Ann Woll. Would you write to a celebrity if you saw their profile online? Thoughts and comments are welcome. Do you want dating, relationship and lifestyle advice delivered weekly to your inbox? Sign up for our Weekly Flirt newsletter. I never knew that Sinead sang that song… I know her for a lot of other songs though… crazy. Skin ‘ead O’Connor made Prince’s “Nothing Compares 2 U” a global hit. Thanks for catching it. We’re glad you’re paying attention and stand corrected. If I was a celebrity on a dating site, I’d not reveal my true identity, because you could be leaving the door open for that crazy stalker, who always wanted to harm you. Possibly. Does any celebrity want a lover who will be obssessed with their whereabouts? Maybe. Who knows? Gotta be so careful.